The Chaos Trooper adult-sized figure is the newest collaborative sculpt from Real X Head and Onell Designs. 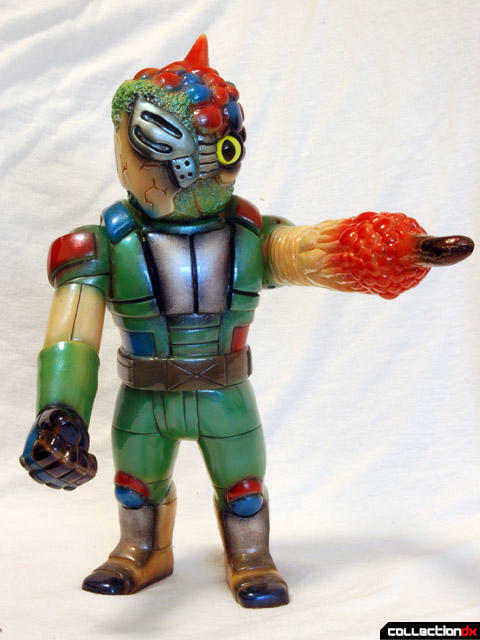 In essence, it is a scaled up vinyl rendition of the Chaos Troopers from the Chaos Invasion Custom Corps, which featured all sorts of crazy Mutant Chaos Glyos mashups. 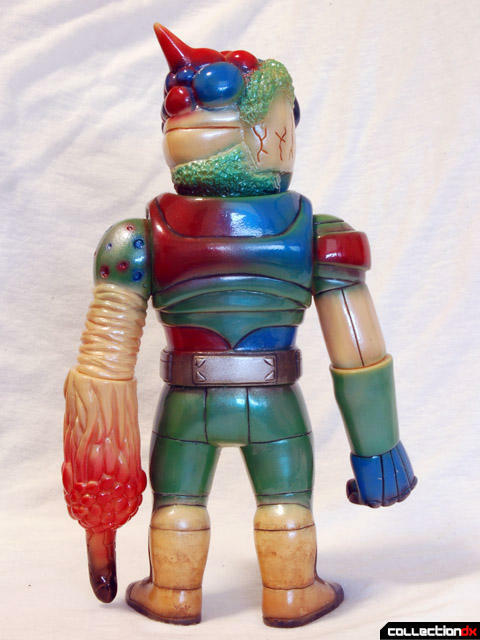 Mutant Chaos from the Real X Head line is a shapeshifter, seen merged with characters from the Glyos universe previously with the Pheyaos figures, which were more Chaos than Traveller. The new Trooper swings the balance the other way, being primarily a Glyos-looking figure with a Chaos head and probe arm. Compare him with Wraith Pheyden and an Excellis build of mine to see where the details in the armor match up. The translation of the Glyos Traveller armor into a larger figure makes this my favorite Real X Head sculpt yet. The heroic proportions make for a great looking figure, and the details are sharply rendered. The Chaos Trooper is articulated at the shoulders, neck, waist, and features swivel elbows. Thanks to the angle cut of the elbows, you can get some decent variety out of the probe arm, even straightening it out to look like he is firing a blast! The elbow joints also allow for interchangeability with the other Adult parts, including the Callgrim gun arm andthe Chaosman weapon hand. This particular Chaos Trooper was actually painted by me using Monster Kolor. 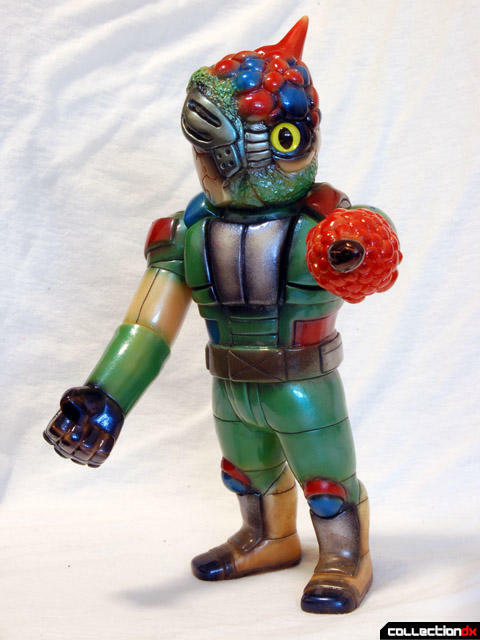 It started out life as a flesh-colored blank, which was the first version released both in Japan by Real X Head and in the US by Onell. 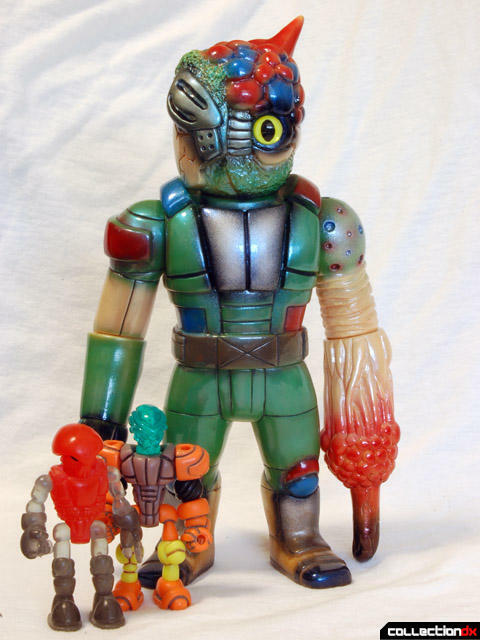 I painted mine in Frankenruge colors, the most popular villain from Barom-1, to match the Frankenruge tribute Mutant Chaos, and a Glyos Chaos Trooper custom I did as well. 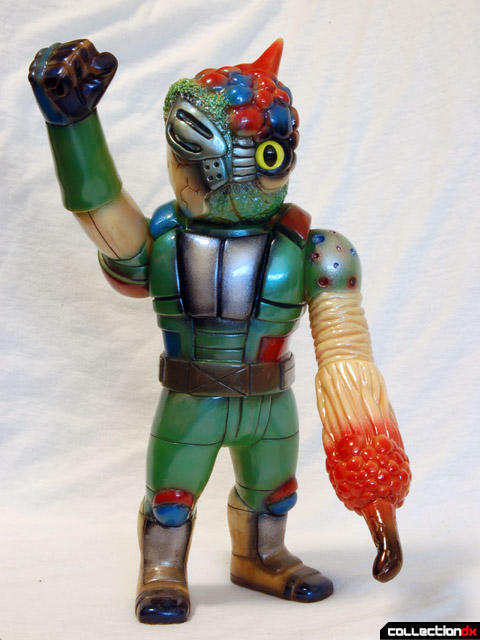 There have been a ton of painted Chaos Troopers released in Japan in highly limited numbers, but so far only one painted release for the US. Back over the summer, Real X Head USA offered an open run preorder of Clone Trooper-inspired Chaos Troopers on white vinyl. There was also a white unpainted version offered at the same time. Since we’re on the subject of the difference between the Japanese and US offerings of the Onell vinyls, I’m going to take a moment to vent. 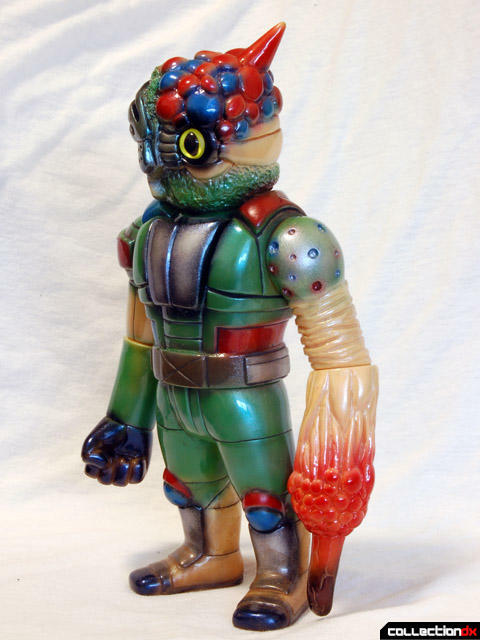 It is a huge disappointment that there have been so many Japanese-exclusive releases of the Onell crossover sculpts, while only a limited few have been offered to the US fans. I get that at the end of the day, they are Mori’s toys and he can do what he wants with them, since they do sell. 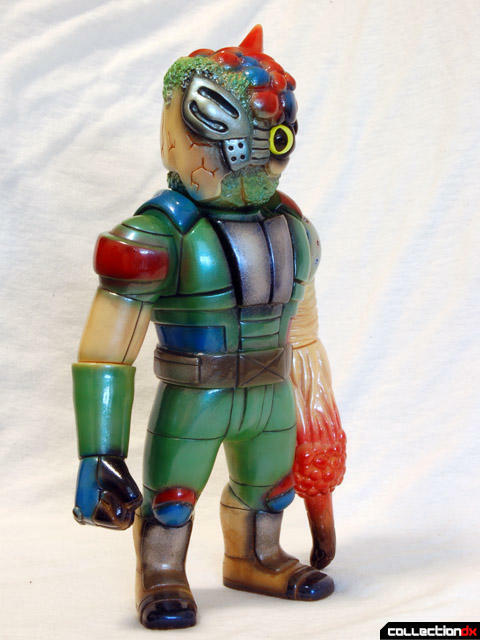 It’s a big disappointment, however, to see US Glyos fans that are otherwise unaware of the workings of indy vinyl clamoring for more of these toys and being unable to get them. 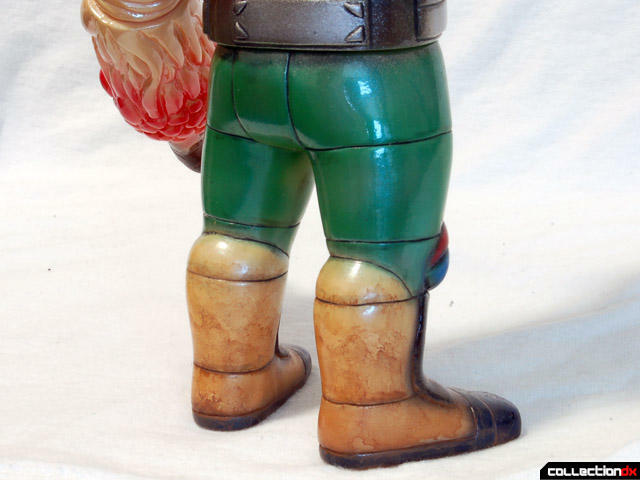 So far the Glyos character minis have been primarily exclusive to the US, but the Adult figures are just too much fun to keep out of Glyos fans’ hands. I post these reviews of the crossover stuff both to expand our database and to show fans what else is out there. At the same time, I feel bad having to add the caveat that this toy is great, but you are going to have a heck of a time finding one. If you can find one, they are super fun. 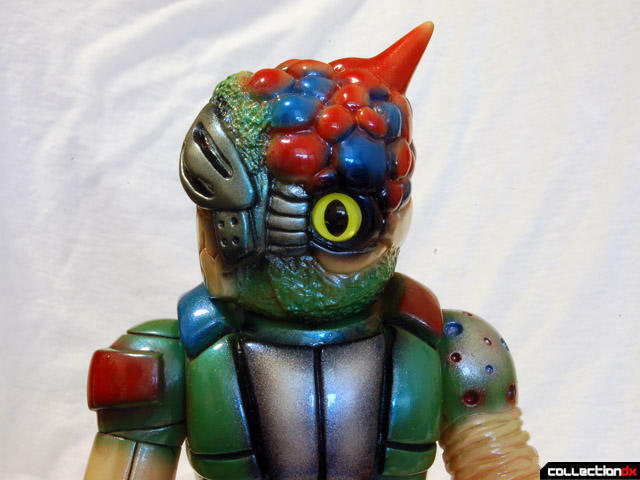 Just don’t overpay, since we should hopefully see some more offered directly to Glyos fans in the future.